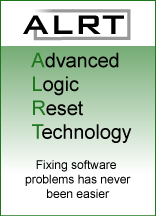 ALRT, or Advanced Logic Reset Technology, is a system created by Dentron that allows you to restore your computer software to its original configuration using a single disk and a few minutes of your time. After a few simple steps, all foreign files are deleted, practice specific information is kept safe, and network settings are restored to their original settings. How Will Advanced Logic Reset Technology Benefit You? As viruses 'malware' become more common, it is important to have the ability to recover easily. In the event of a system software malfunction, ALRT can restore your software and remove malicious files left behind. Replacing a hard-drive is not a difficult task; however, reinstalling software and reconfiguring the computer can take hours for even the most diligent computer technician to complete. With ALRT your software and configurations are a click away. If critical settings are changed and your system begins to fail, ALRT gives you the luxury of restoring the system to it’s original working state in minutes without calling a technician. Over time, computers can become sluggish and appear to be outdated. Often times, erasing the harddrive and reinstalling the software will cause the comptuer to regain lost performance. ALRT provides the ability to perform a fresh installation at no cost, thereby extending the usable life of your system for two to three years.